Špulák O, Kacálek D, Balcar V (2019). Seven spruce species on a mountain site - performance, foliar nutrients, and forest floor properties in stands 20 years old. iForest 12: 106-113. Norway spruce is often considered to have a negative impact on a site, yet it is native to many mountain regions of Europe. The relative influence of Norway spruce on site properties has frequently been compared with that of both broadleaved and other coniferous tree species. In our study, growth, as well as needle, forest floor, and topsoil chemistry were compared between Norway spruce and introduced spruce species (white, black, red, Serbian, Sitka, and blue spruce), all growing on the same, formerly polluted mountain site. There were few differences in needle nutrient status between the introduced spruce species and native Norway spruce. The chemistry of forest floor horizons beneath some of the non-native species showed less acidity and better conditions of the soil sorption complex. There were no significant differences in the nutrient pools, indicating that the influence of the various spruce species on the site was comparable. Given the small differences observed in the various nutritional characteristics, it appears that, under the conditions of the study site, the alternative spruces had substituted for the role of Norway spruce before its recovery in the 2000s. 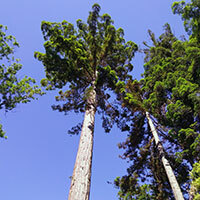 The six spruces grew quite consistently during 2001-2012, while the mean height of Norway spruce shifted from the lowest 176 cm (2001) to one of the tallest. At 710 cm (2012), its height had become comparable with that of Sitka. The poorest performing were black spruce (due to bark beetle attack) and blue spruce (due to bud blight infestation and decline). Linking foliar chemistry to forest floor solid and solution phase organic C and N in Picea abies [L.] Karst. stands in northern Bohemia. Plant and Soil 283: 187-201. Foliar analyses of conifers on serpentine and gabbro soils in the Klammath mountains. Madroño 61 (1): 77-81. Acute air pollution injury of ten coniferous species in the Trutnov region. Lesnictví-Forestry 42 (10): 460-472. Changes in forest soil properties and spruce stands characteristics after dolomite, magnesite and serpentinite fertilization. European Journal of Forest Research 134: 981-990. Nutrient return to the forest floor through litter and throughfall under 7 forest species after conversion from Norway spruce. Forest Ecology and Management 309: 66-75. Plant response to nutrient availability across variable bedrock geologies. Ecosystems 12: 101-113. Gemmamyces bud blight of Picea pungens: a sudden disease outbreak in Central Europe. Plant Pathology 65 (8): 1267-1278. Entomofauna of dying young spruces Picea abies (L.) Karst. in the area after forest decline in the Izerskie Mountains. Folia Forestalia Polonica, Series A 51 (2): 161-170. A simple sequentially rejective multiple test procedure. Scandinavian Journal of Statistics 6: 65-70. Species-specific properties of forest floor under mountain conditions. Austrian Journal of Forest Science 130 (1): 45-59. Temporal and spatial change in diameter growth of boreal Scots pine, Norway spruce, and birch under recent-generation (CMIP5) global climate model projections for the 21st century. Forests 9 (3): 118. Selected biological and chemical properties of forest floors across bedrock types on the north coast of British Columbia. Canadian Journal of Forest Research 30 (6): 971-981. Ten-year postharvest effects of silviculture systems on soil-resource availability and conifer nutrition in a northern temperate forest. Canadian Journal of Forest Research 34 (4): 800-809. Landscape-scale spatial patterns of winter injury to red spruce foliage in a year of heavy region-wide injury. Canadian Journal of Forest Research 36 (1): 142-152. FactoMineR: an R package for multivariate analysis. Journal of Statistical Software 25 (1): 1-18. Species and spacing effects of northern conifers on forest productivity and soil chemistry in a 50-year-old common garden experiment. Journal of Forestry 106 (2): 83-90. Long-term development of nursing mixtures of Sitka spruce and larch species in an experiment in northern Scotland. Forest Systems 23 (3): 590-597. Air pollution and forestry in Czechoslovakia. Environmental Monitoring and Assessment 12 (3): 227-235. White spruce foliar δ13C and δ15N indicate changed soil N availability by understory removal and N fertilization in a 13-year-old boreal plantation. Plant and Soil 361: 375-384. Mehlich 3 soil test extractant: a modification of Mehlich 2 extractant. Communications in Soil Science and Plant Analysis 15: 1409-1416. Comparison of new foliar nutrient thresholds derived from van den Burg’s literature compilation with established central European references. European Journal of Forest Research 131: 1461-1472. Long-term nutritional trends of conifer stands in Europe: results from the RECOGNITION project. European Journal of Forest Research 123: 305-319. Nutrient uptake and use efficiency in co-occurring plants along a disturbance and nutrient availability gradient in the boreal forests of the southwest Yukon, Canada. Journal of Vegetation Science 28: 69-81. The health and nutritional status of Norway spruce stands in the Krušné hory Mts. 15 years subsequent to the extreme winter of 1995/96. Journal of Forest Science 59 (9): 359-369. Nitrogen deposition and its impact on forest ecosystems in the Czech Republic - change in soil chemistry and ground vegetation. iForest - Biogeosciences and Forestry 10 (1): 48-54. Major changes in forest carbon and nitrogen cycling caused by declining sulphur deposition. Global Change Biology 17: 3115-3129. Forest ecosystems. John Hopkins University Press, London, UK, pp. 632. Understanding changes in black (Picea mariana) and white spruce (Picea glauca) foliage biomass and leaf area characteristics. Trees 28: 345-357. Nutrient concentrations and nitrogen mineralization in forest floors of single species conifer plantations in coastal British Columbia. Canadian Journal of Forest Research 30 (9): 1341-1352. Chemical quality of aboveground litter inputs for jack pine and black spruce stands along the Canadian Boreal Forest Transect Case Study. Écoscience 21 (3-4): 202-216. Part XII: Sampling and analysis of needles and leaves. In: “Manual on Methods and Criteria for Harmonized Sampling, Assessment, Monitoring and Analysis of the Effects of Air Pollution on Forests” (UNECE ICP Forests Programme Co-ordinating Centre ed). Thünen Institute of Forest Ecosystems, Eberswalde, Germany, pp. 19. Linking microbial communities, functional genes and nitrogen-cycling processes in forest floors under four tree species. Soil Biology and Biochemistry 103: 181-191. Nitrogen availability in forest floors of three tree species on the same site: the role of litter quality. Canadian Journal of Forest Research 30 (11): 1698-1706. Ggbiplot. A tool for visualizing the results of PCA. Software, Web site.